Craig Sissons is just one of several Predators enjoying a big season this year. Saturday they completed a 3-0 road trip through western Canada with a 2-0 victory over the Calgary Flames. Any doubts that the Predators are legitimate Stanley Cup contenders were erased in Saturday’s 2-0 victory over the Calgary Flames. The Predators completed a three game sweep of Western Canada in decisive fashion. They romped over Vancouver, Edmonton and Calgary, winning all three games in regulation and posting two shutouts in the process. Their overall record improved to 21-7-4, and they begin the week leading the Western Conference. They got another stellar game from Pekka Rinne. It was also an old school style, ultra defensive battle. Neither team scored in either the first or third periods. The Predators got second period goals from Ryan Johansen and Kevin Fiala. 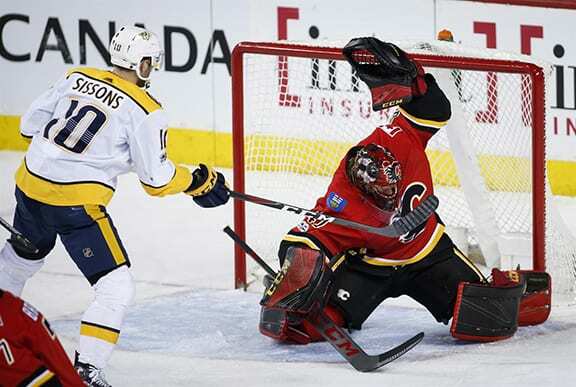 They also managed to successfully kill a second period 5-on-3 penalty that proved the key to the game, as Fiala’s goal came near the end of the period, and very close after Nashville had stopped the Flames’ power play. An extra bonus for the Predators was Victor Arvidsson’s assist on the Johansen goal, his 100th NHL point. It was the second straight milestone game for a Predator. Number two goalie Juuse Santos 46 save 4-0 shutout against Edmonton also set a saves record for a shutout. Santos is 3-0-1 in his last four games with a hefty .952 save percentage. Nashville returned home Tuesday for games against Winnipeg, then Carolina on Thursday before heading to Dallas for a Saturday contest.